Multiple behavior charts are designed for kids who are working on improving several behaviors at once. Usually these behaviors are all related such as a morning routine or bedtime routine. You might have a chart related to study habits or improved school behavior. Write the behaviors your child is working on at the top of the chart. When your child finishes that task for the day or shows that behavior, you can place a star, sticker, checkmark or smiley face in the box. Set a goal of how many stickers or smiley faces your child needs to earn each day. When your child reaches that goal for the day he/she will earn a reward. If the chart is about a bedtime routine, your child will earn the reward the next day. The chart should be kept in a readily accessible and visible place – this helps your child remember to follow it. What place is appropriate will depend on the types of behaviors you are working on. For example, if you are working on behaviors that are all related to getting ready for school, you might hang the chart on the back of your child’s bedroom door, on the wall next to their door, or in the hallway outside the bathroom. Working on too many behaviors at once could be overwhelming! Make sure that your child has the chance to be successful. Try to limit the number of changes you are asking for all at once. It might take some trial and error to set a goal for your child. If he is earning 3 rewards a day, that isn’t going to work very well for you. If he is never able to earn any rewards, then that isn’t going to work either. You want your child to stretch a little to earn the reward, but you want him to have days where he does earn it! Long-term rewards can work, but they might not be enough of an incentive for younger children. Waiting the whole week to earn a reward might feel like a very long week. If your child has a hard Tuesday, what is her incentive to have a better Wednesday? You might set a longer-term goal in addition to a daily goal. Maybe after a certain number of good weekdays or after a total number of stars are earned, that earns an additional reward on the weekend. This incentive chart shouldn’t be used as a consequence. Kids shouldn’t lose stars or stickers. If they are not making good choices, then they simply don’t earn that star or sticker and they will have to try harder. As your child consistently meets the goal, you can increase the goal a bit or you might choose to celebrate together and then choose another set of behaviors to focus on. 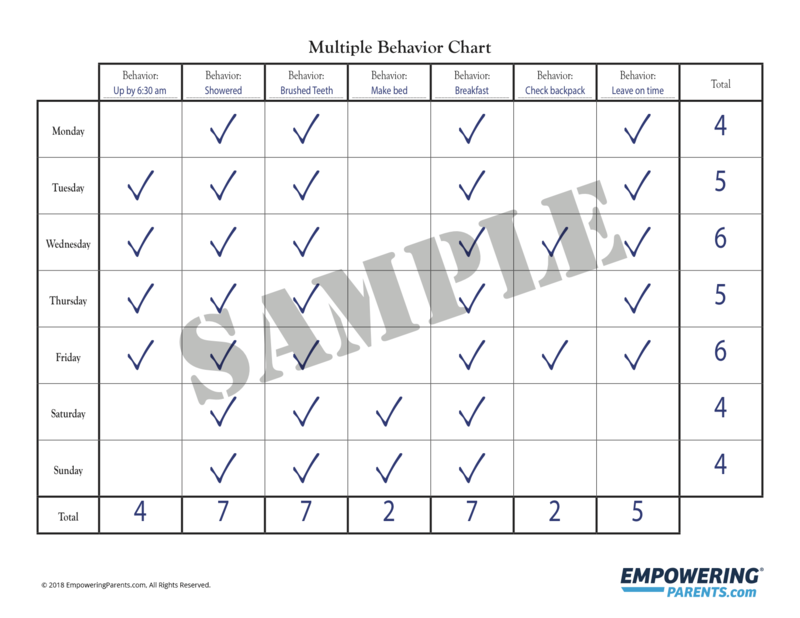 Get your free Multiple Behavior Chart for Kids now!